This review highlights many of the fundamental concepts and events in the development of corneal transplantation - from ancient times to modern. Tales of eye, limb, and even heart transplantation appear in ancient and medieval texts; however, in the scientific sense, the original concepts of corneal surgery date back to the Greek physician Galen (130-200 AD). Although proposals to provide improved corneal clarity by surgical interventions, including keratoprostheses, were better developed by the 17 th and 18 th centuries, true scientific and surgical experimentation in this field did not begin until the 19 th century. Indeed, the success of contemporary corneal transplantation is largely the result of a culmination of pivotal ideas, experimentation, and perseverance by inspired individuals over the last 200 years. Franz Reisinger initiated experimental animal corneal transplantation in 1818, coining the term "keratoplasty". Subsequently, Wilhelmus Thorne created the term corneal transplant and 3 years later Samuel Bigger, 1837, reported successful corneal transplantation in a gazelle. The first recorded therapeutic corneal xenograft on a human was reported shortly thereafter in 1838-unsurprisingly this was unsuccessful. Further progress in corneal transplantation was significantly hindered by limited understanding of antiseptic principles, anesthesiology, surgical technique, and immunology. There ensued an extremely prolonged period of debate and experimentation upon the utility of animal compared to human tissue, and lamellar versus penetrating keratoplasty. Indeed, the first successful human corneal transplant was not performed by Eduard Zirm until 1905. 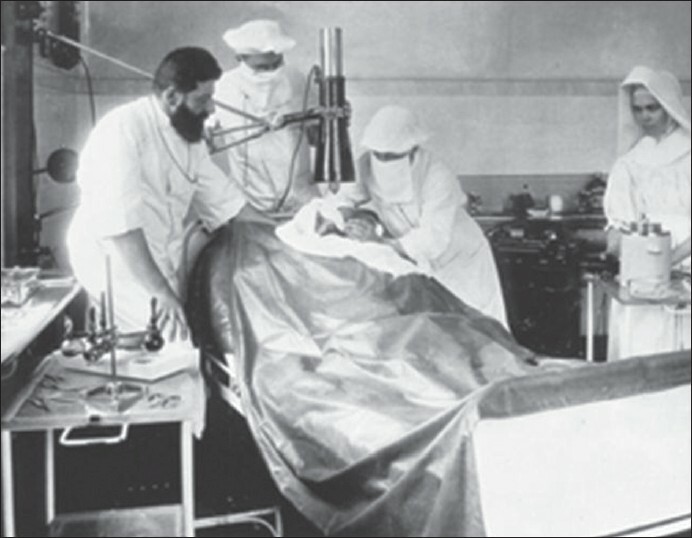 Since that first successful corneal transplant, innumerable ophthalmologists have contributed to the development and refinement of corneal transplantation aided by the development of surgical microscopes, refined suture materials, the development of eye banks, and the introduction of corticosteroids. Recent developments, including the replacement of selected corneal layers rather than full-thickness keratoplasty, have the potential to improve or transform corneal transplant surgery in the future. Hereditary dystrophies affecting the central retina represent a heterogeneous group of diseases. Mutations in different genes may be responsible for changes of the choroid (choroideremia), of the retinal pigment epithelium [RPE] (Best's disease), of the photoreceptor outer segments (Stargardt's disease) and of the bipolar and Mueller cells (x-linked retinoschisis). The correct diagnosis of hereditary retinal dystrophies is important, even though therapeutic options are limited at the moment, as every patient should get a diagnosis and be informed about the expected prognosis. Furthermore, specific gene therapy of a number of diseases such as Leber congenital amaurosis, choroideremia, Stargardt's disease, Usher Syndrome and achromatopsia is being evaluated at present. Classic examinations for patients suffering from hereditary retinal dystrophies of the central retina are funduscopy - also using red-free light - visual-field tests, electrophysiologic tests as electro-retinogram [ERG] and multifocal ERG and tests evaluating color vision. Recently, new imaging modalities have been introduced into the clinical practice. The significance of these new methods such as high-resolution spectral-domain optic coherence tomography [SD-OCT] and fundus autofluorescence will be discussed as well as "next generation sequencing" as a new method for the analysis of genetic mutations in a larger number of patients. The technical progress of the recent years has revolutionized imaging in ophthalmology. Scanning laser ophthalmoscopy (SLO), digital angiography, optical coherence tomography (OCT), and detection of fundus autofluorescence (FAF) have fundamentally changed our understanding of numerous retinal and choroidal diseases. Besides the tremendous advances in macular diagnostics, there is more and more evidence that central pathologies are often directly linked to changes in the peripheral retina. This review provides a brief overview on current posterior segment imaging techniques with a special focus on the peripheral retina. 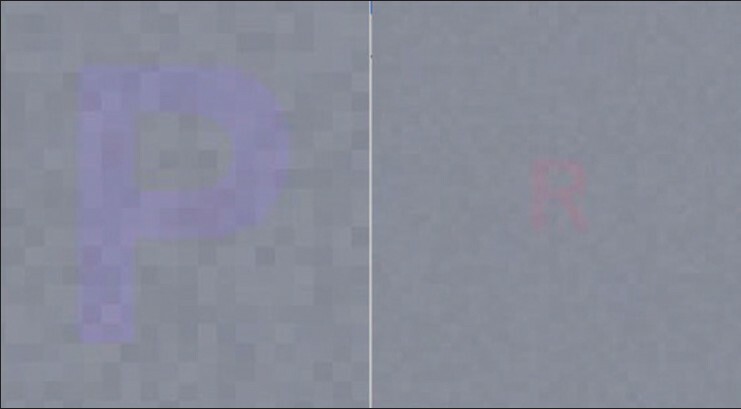 Purpose: To evaluate the efficacy of a computerized color vision testing (Arden color contrast test) as a screening test for detection of diabetic macular edema (DME). 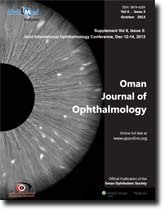 Materials and Methods: A consecutive, prospective case series of 83 eyes of 42 diabetic patients with and without macular edema was enrolled. Macular edema was assessed clinically by stereoscopic grading and by central retinal thickness measurement with optical coherence tomography (OCT). Additionally, a computerized chromatest for the protan- and tritan-axis was performed. Analysis of test characteristics included receiver operating characteristic (ROC) curves and calculated sensitivity and specificity. 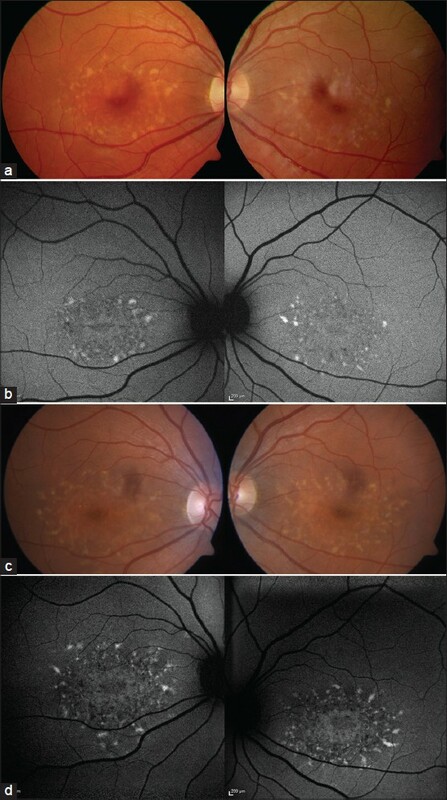 Results: Sixty-one eyes had clinically significant macular edema (CSME). OCT yielded an area under the ROC curve (AUC) of 0.92. Color vision testing yielded an AUC of 0.82 for the tritan- and 0.80 for the protan-axis. Using a cut off of 199 microns OCT resulted in a 100% sensitivity at 39% specificity. With a cut-off of 4.85, color testing yielded a sensitivity of 100% at a specificity of 8% on the tritan-axis, respectively. Considering OCT instead of clinical examination as a reference standard resulted in a comparable high sensitivity, but low specificity for color vision testing. Disturbance of the tritan axis was more pronounced than for the protan axis in present macular edema and also better correlated (r = 0.46) with retinal thickness measured with OCT. Conclusions: Computerized, quantitative color testing using the chromatest allows detection of diabetic maculopathy with high sensitivity. 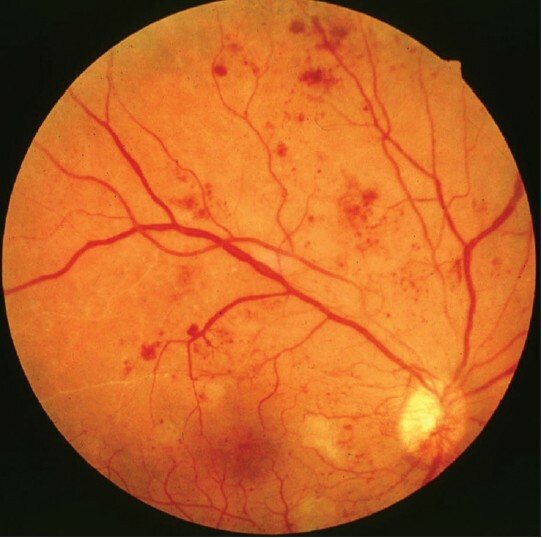 However, only a low specificity exists for retinal macular edema, as in diabetic retinopathy (DR) frequently abnormalities of the tritan axis exist before any retinal thickening occurs. A 28-year-old female with a history of contact lens wear presented with a 1 week history of pain and photophobia in her left eye. In vivo confocal microscopy (IVCM) and corneal scrape confirmed the diagnosis of Acanthamoeba keratitis (AK) which was treated with intensive topical propamidine isethionate (0.1%) and chlorhexidine (0.02%) with tapering dosage over 11 months. Five years after complete resolution of AK and cessation of all contact lens wear, the subject presented to her optometrist with a history of ocular discomfort and mild photophobia. Without further investigation she was prescribed topical corticosteroids. Three weeks later she presented with pain and reduced vision in the left eye. Slit-lamp examination revealed focal, inferior corneal stromal edema. 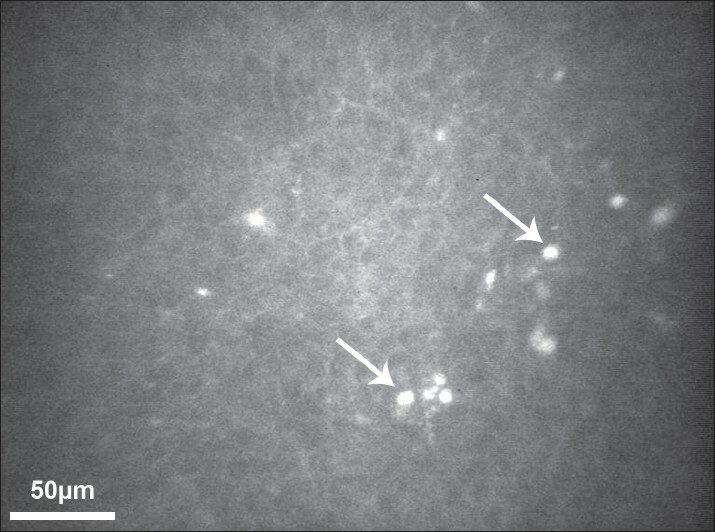 IVCM confirmed widespread Acanthamoeba cysts. Treatment with topical polyhexamethylene biguanide (PHMB) 0.02% and propamidine isethionate 0.1% resulted in resolution of the AK. Despite an initially mild AK, this subject presumably retained viable Acanthamoeba cysts in her cornea 5 years after the initial episode. This report highlights the importance of caution when using corticosteroids in patients with a previous history of AK, even in the relatively distant past. Patients with AK should be warned regarding the risks of recurrence following presumed resolution.